Credits: X-ray: NASA/CXC/IPMU/J.Silverman et al; Optical: NASA/STScI/Caltech/N.Scoville et al. 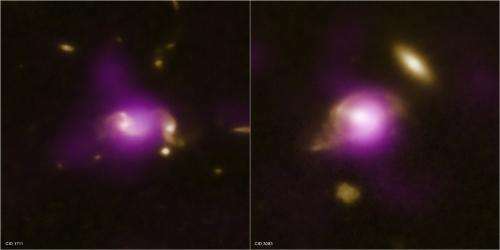 (PhysOrg.com) -- Astronomers have used a large survey to test a prediction that close encounters between galaxies can trigger the rapid growth of supermassive black holes. Key to this work was Chandra's unique ability to pinpoint actively growing black holes through the X-rays they generate. The researchers looked at 562 pairs of galaxies ranging in distances from about 3 billion to 8 billion light years from Earth. They found that the galaxies in the early stages of an encounter with another were more likely than isolated, or "lonelier" galaxies to have actively growing black holes in their cores. These two composite images show a sample of the pairs of galaxies that are undergoing close encounters in the survey. In these images, the data from NASA's Chandra X-ray Observatory are shown in purple and Hubble Space Telescope data are in gold. In both images, the point-like X-ray source near the center is generated by gas that has been heated to millions of degrees as it falls toward a supermassive black hole located in the middle of its host galaxy. The other faint X-ray emission may be caused by hot gas associated with the pair of galaxies. The authors of the study estimate that nearly one-fifth of all moderately active black holes are found in galaxies undergoing the early stages of an interaction. This leaves open the question of what events are responsible for fueling the remaining 80% of growing black holes. Some of these may involve the late stages of mergers between two galaxies. Less violent events such as gas falling in from the halo of the galaxy, or the disruption of small satellite galaxies are also likely to play an important role. The survey used in this research is called the Cosmic Evolution Survey (COSMOS), which covers two square degrees on the sky with observations from several major space-based observatories including Chandra and Hubble. Accurate distance information about the galaxies was also derived from optical observations with the European Southern Observatory's Very Large Telescope. The researchers compared a sample of 562 galaxies in pairs with 2726 solo galaxies to come to their conclusions. A paper describing this work has been accepted for publication in The Astrophysical Journal. The study was led by John Silverman from the Institute for the Physics and Mathematics of the Universe (IPMU) at the University of Tokyo in Japan. There are 54 co-authors from various institutions around the world. How often do giant black holes become hyperactive? Easy. If galaxies grow from within through ejections of new matter from their core, and form the basis for forming a new nearby galaxy...And if massive core stars in their active state accelerate this process....Such massive 'grey'-holes would be expected to be in their active state longer and more frequently than the greater population of galaxies. No need for confusion here. Just apply a little countervailing logic. Just apply a little countervailing logic. Welcome back Tux. We missed you. The repulsive one has gone quiet and ether boy has been dominating the conversation with himself. Never the less, your application was denied. AGN's near galactic interactions are most likely caused by the disturbance of gravity resulting from the proximity of another galaxy. Why make up new physics to explain something that seems pretty simple? I am curious as to how often we see double AGN's in these events? i.e. AGN's in both of the merging/colliding/passing galaxies? The article raises the question of what factors contribute to creation/maintenance of the other 80% of AGN's, those not associated with galactic interactions. My guess, worth less than the pixels displaying it, is AGN's just happen. A stellar collision here, supernova there, thicker primordial soup here, binary star ejected over there, etc. Something "random" that causes a chain reaction/feeding frenzy. Not very creative, am I? In this model, the remaining 80% of active core mother stars likely also periodically become active, producing cosmic ray superwaves like that now illuminating the Crab nebula. The more massive they grow, the more frequently they become unstable and active. Since they grow largely from within their cores through new matter materialization, there is no need to find various accretion mechanisms to explain the enormous outflows sometimes observed. They just happen to be active as observed. Likely most large galaxies are formed this way. Rather simple model, but which steps in the holy water. Thus, it represents an assault for the rationally-minded. Note the (your-own?) forthcoming reactions. It will offer a clue about the mental fixations of the irrationally rational-minded. Nature does not care about your fixations! Nature doesn't care about the pet theory you have adopted either. Until somebody does some real work and shows that it has a foot to stand on, and then shows that it explains anything better than the current model it is just another crackpot theory. You can "intuitivize" it all you want, but it is just nonsense until some real scientific work is done to support it. Especially when metaphysical mumbo jumbo gets thrown in with it. We don't care about your fixations, at least until you show us some real work supporting anything you say. Nature doesn't care about the pet theory you have adopted either. http://arxiv.org/....1499v1. "Is the Universe Expanding?" 3. "Is the Universe expanding?" 4. "Origin and Evolution of Life"
Begin to actively wave their metaphorical hands generating vast quantities of powerful Mana out of nothing except the power of Tuxford's mind. By magically creating new matter of ... of ungh I know TuxMagic as Seen On TV. Rather simple model, but which steps in the holy water. Steps in crap anyway by creating matter and energy out handwaving. "Here at As Seen On TV labs we have recently hired Tuxford to design our new Mr. Fusion, which will only use that name bacause its so cool, as Mr. Fusion will actualy produce energy by waving simulacra of Tuxfords hands. The massive power to ignore all reality in the TuxSimHandsTM* will produce the power needed to fill our new line of WoopieCushions with hot air." *Peanuts are sometimes processed on the same equipment. Sorry Oliver your vast and astoundingly ingenious thesis of Neutron Repulsion which is powerful enough to disrupt Galaxies and stop the formation of Black Holes has convinced me. I now know that a force that is that powerful would make all matter disperse into a thin gas. Much like that that is filling As Seen On TV Woopie Cushions thus neither you nor I can possibly exist. Goodbye Oliver you have proved you don't exist. Unless of course you can actually show some evidence for Neutron Repulsion and give us an idea of what its properties are beyond the magic of whatever you want that day as opposed to what you wanted yesterday. Remember Oliver its your own faulty when you contradict yourself. And pretending you aren't doing that doesn't change fact that you do.